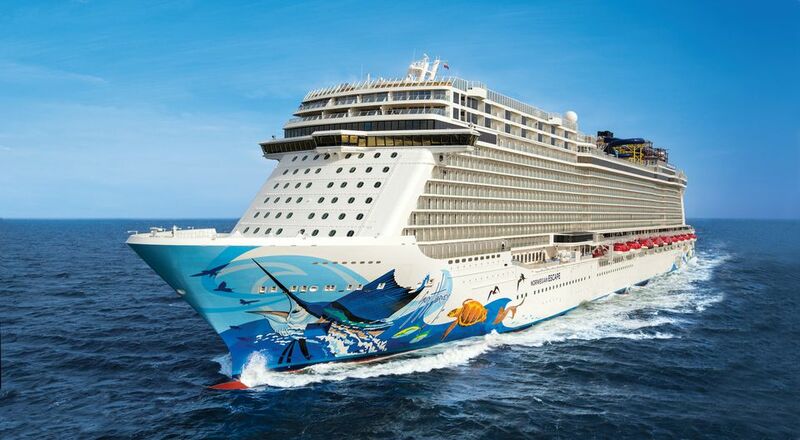 Norwegian Cruise Line launched its largest cruise ship, the 4,268-passenger Norwegian Escape in October 2015. This 164,00 ton, 20-deck cruise ship is filled with fun activities, entertainment, and dining and drinking establishments. It's a great ship for families and younger cruisers, although active seniors should enjoy it, too. The Norwegian Escape is similar to her two sister ships, the Norwegian Breakaway and Norwegian Getaway, but just enough different to put her into the "Breakaway Plus" class. The Norwegian Escape carries about 200 more guests than her two older sister ships and has a more expansive outdoor activity area, complete with Ropes Course and large AquaPark. The Norwegian Escape sails from her home port of Miami year-round on 6- to 14-day cruises to the Bahamas and the eastern and/or western Caribbean. Sailing to these warm weather destinations fits perfectly with her large amount of outdoor activity space, outdoor dining venues, and outdoor bars. With a large resort-style ship, cruise travelers expect a lot of different places to dine, and the Norwegian Escape delivers, with 28 dining options. Some of these are luxurious and gourmet, others are casual and takeaway. Although several of the venues are complimentary, many are either a fixed surcharge or a la carte. The Norwegian Escape has three main complimentary dining rooms - Manhattan Room, Taste, and Savor. These are contemporary and elegant, with diverse menus. Iron Chef Jose Garces designed two great new dining options for the cruise ship. The first is Bayamo, a Latin seafood restaurant with indoor and outdoor dining areas. I had dinner there and loved the tuna with watermelon appetizer, shrimp with garlic sauce and charred tomato, and ice cream/sorbet sampler for dessert. Chef Garces' other restaurant is the casual Pincho Tapas Bar, where patrons sit at the bar and watch their tapas being prepared. The third exciting new restaurant on the Norwegian Escape is the Food Republic, an upscale food emporium from the Pubbelly Restaurant Group. The Food Republic features small plates from around the world, perfect for sharing or sampling an around the world menu. The Norwegian Escape has 21 bars and lounges. Some of these are great for a casual drink, others provide more elegant surroundings. I especially loved the District Brew House, a new partnership for Norwegian with the Wynwood Brewing Company of Miami. This brewhouse comes with a keg room, 24 draft beers on tap, and more than 50 different bottled beers. It also has some delicious snacks to go along with the beer, and the decor includes one of those old photo booths, where you can take your own instant photo selfie and add it to the pinboard in the bar. The ship has many more bars and lounges, and many have both indoor at outdoor seating, taking full advantage of the Norwegian Escape's Caribbean itineraries. The Norwegian Escape cruise ship has 2,175 staterooms, and there's something in every price range. One thing common on the carpet in the cabin passageways of all Norwegian ships is that the "fish face forward", which makes finding your cabin much easier. The carpet in the hallways features small fish all swimming in the same direction--forward. So, if you know the location of your cabin (forward or aft), you can always walk the correct direction. On a large ship, it's sometimes easy to get lost on the cabin decks, and this feature can save a lot of steps. The large suites are in The Haven, and the most prevalent standard staterooms are the balcony cabins. The Norwegian Escape also has nice oceanview cabins with a large window overlooking the sea, and inside cabins for the budget-conscious cruiser. Solo travelers will especially enjoy the Studio Cabin complex, which features 82 tiny cabins designed for one person each. These cabins do not have a single supplement. The complex has its own Studio Lounge for the solo travelers, which is a great gathering place. The Haven is the Norwegian Escape's private enclave for guests staying in 95 of the suite accommodations on the cruise ship. The Haven guests share a huge courtyard with pool, bar, and private restaurant. They also have many other benefits, including the services of a concierge, priority embarkation and debarkation, and priority tender boarding. The interior common areas of the Norwegian Escape cruise ship are contemporary and well-designed for the large ship. The layout is similar to the Norwegian Getaway and Norwegian Breakaway. The Mandara Spa, Salon, and Fitness Center is large and features a huge gym, beauty salon, and many body treatment rooms. The thermal relaxation area shown in the photo above is part of the thermal suite, which also features a sauna, steam rooms, and snow room. The Norwegian Escape sails to the warm Caribbean year-round from Miami so it's not surprising that the large, resort-style cruise ship has impressive outdoor decks that make guests want to play or relax out in the sunshine. The outdoor decks have areas for adults and kids of all ages. Spice H2O is the adult relaxation, dance, and movie area. The three-story Ropes Course is a challenge for kids of all ages, as is the Aqua Park, with its five exhilarating water slides. Younger children haven't been forgotten on the Norwegian Escape. They have their own Kid's Aqua Park with numerous ways to get wet. The entertainment on the Norwegian Escape is first-rate. The cruise ship has two Tony Award-winning musicals in the Escape Theater, which is the largest entertainment venue on the ship. The choreography of "After Midnight" is exceptional, and the costumes are amazing. The entertainers take the audience back to Harlem's Cotton Club. Along with the great singing, dancing, and costumes, an onstage jazz band brings in the big band sound of Duke Ellington. "Million Dollar Quartet" also had a run on Broadway. Guests on the Norwegian Escape will certainly recognize the quartet--Elvis Presley, Johnny Cash, Jerry Lee Lewis, and Carl Perkins. The singers/actors do a great job of capturing the music and the style of these famous icons. A recreation of their December 1956 jam session includes classic rock and roll that will be loved by anyone who loved music from this memorable era. The Supper Club venue features dinner and a show entitled, "For the Record: The Brat Pack Live at the Supper Club". This entertaining cabaret show looks back at the soundtracks of many of John Hughes' movies from the 1980's like Pretty in Pink and The Breakfast Club. The show is so much fun that I hardly knew what I was eating! Headliners Comedy Club has been a popular lounge on other Norwegian Cruise Line ships, and past cruisers are happy to find this venue on the Norwegian Escape. Norwegian Escape is the first ship in the Norwegian Cruise Line fleet to offer childcare services for children ages 6 months to 3 years. The Guppies Nursery has a playtime area with age-appropriate activities and a separate place for napping. In addition to the age-appropriate activities, Splash Academy features a Nickelodeon-themed night. Kids can also enjoy an expanded Circus program and participate in an environmental interactive program. Of course, the Splash Academy has video games, a place to dance, and arts and crafts. Teens have their own space near the ship's video arcade with trendy lounge furniture and a central gaming station. The area also has teen favorites like foosball and air hockey. At night, Entourage transforms into a teen-only nightclub.